Seattle MC Ishmael Butler is front and center in two shows this week, a reunion concert by jazzy ’90s hip-hop stars Digable Planets and a New Year’s Eve show by his current group, Shabazz Palaces. Time travelers live among us. Take, for example, Ishmael Butler, frontman for the classic ’90s rap group Digable Planets and the current avant-garde duo Shabazz Places. Both are playing Seattle this week — the former at the Moore Theatre on Wednesday (Dec. 30), marking the first reunion for Digable Planets since 2011. The latter plays on New Year’s Eve at the Neptune Theatre. 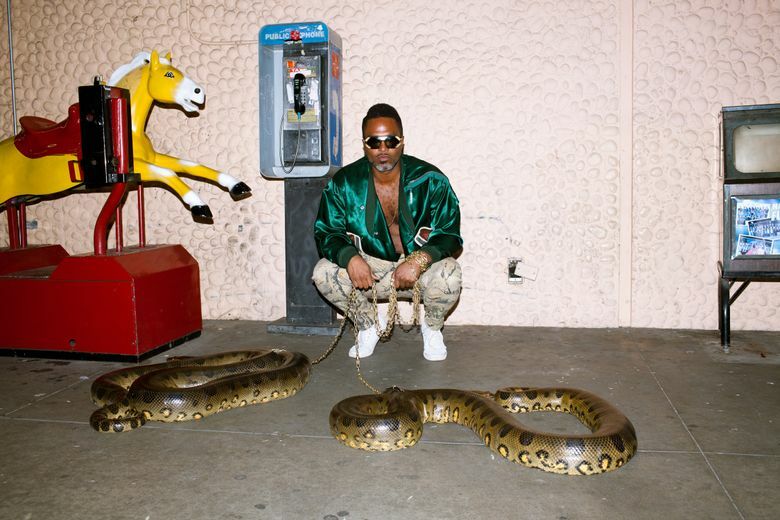 8:30 p.m. Wednesday, Dec. 30, at the Moore Theatre, 1932 Second Ave., Seattle; $24, or $40 for two-show pass including Shabazz Palaces, $40 (877-784-4849 or stgpresents.org). 9 p.m. Thursday, Dec., 31, at the Neptune Theatre, 1303 N.E. 45th St., Seattle; $23.50 or $40 two-show pass including Digable Planets (877-784-4849 or stgpresents.org). Though they share a member, the two groups are quite different. Along with A Tribe Called Quest and Dilated Peoples, Digable Planets is cut from the cloth of a mellow, jazz-inspired strain of hip-hop, whereas Shabazz Palaces is dissonant and distorted, like the sound of a fuzzed-out electric guitar played for the blood moon. This isn’t the first time Seattle has been promised a Digable Planets reunion. The trio was to perform here in 2012 but canceled days before the show, and it looked like the end of the line for the group. There were rumors that Digable member LadyBug Mecca was the holdout, but Butler says the fissure and subsequent healing was a matter of timing — combined with a renewed openness between the members. For the man responsible for one of the smoothest songs in hip-hop history — Digable Planet’s Grammy-winning “Rebirth Of Slick (Cool Like Dat)” — as well as the at times herky-jerky yet celestial sound of Shabazz Palaces, this week marks the pinnacle of an illustrious career. Born in 1969, Butler grew up in Seattle, where his first foray into music was playing alto saxophone in his middle-school jazz band. His youth was contemporary with the release of all the major hip-hop records of the genre’s genesis, starting in 1979. After graduating from Garfield High School in 1987, he moved to the East Coast, where he spent much of his time in New York, Richmond, Va. and Washington, D.C. In 1989, Digable Planets formed in Philadelphia. But Seattle is where the band is reuniting and the process has transported Butler back.